Can You Build a Home Yourself? Home > Finding a Plot > Can You Build a Home Yourself? For some people building their own home means that they will oversee the whole project and possibly help out with some of the more labour intense work. With a little forward planning and research it is possible to tackle more of the work and save a fortune in labour costs. It may be that you plan to build your own property some time in the future. Now is the time to start planning and training for the work involved. Although you may not yet know what type of house you intend to build or indeed where in the country it will be there is plenty of opportunity to plan your part in the actual building. List your skills, chances are you know more about building than you thought. Bricklaying will be a major part of the build with many thousands of bricks being used before the house is complete. Good bricklayers are expensive and very much in demand. By learning this skill you will be able to save thousands of pounds. The same can be said of electricians, heating engineers, roofers and plumbers. Add to this the multitude of general labouring skills and you can quickly see that if you were to pay for all these tradesmen the cost of your build would be sky high. There is an abundance of television programmes about self building and renovating properties, it seems to have taken over from the multitude of gardening programmes that were being broadcast. Learn by the mistakes of others and listen to the experts. Keep a copy of these programmes for future reference. The spin off from so many television programmes about property and house building is the plethora of magazines and books that are available. Start a library of these books and also look out for the more technical books that are available for building students. Her Majesty's Stationery Office will also have a list of books and pamphlets directed at the rules and regulations that surround all aspects of building work. Most adult eduation centres and colleges of further education run courses for the building trade. Why not sign up and learn something about construction, plumbing, heating and the electrical trade? If you don't have the confidence to build your house yourself at least you will be familiar with the work of those that you hire and supervise. 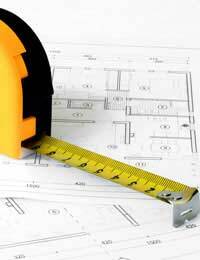 Each year there are home improvement and self build exhibitions in most parts of the country. Attend these for ideas on the latest building materials and what is available for the self builder. It's never too soon to start collecting ideas and making contacts. Let it be known that you are available to help others with their building work. By offering your services for free you will be gaining some useful hands on experience and lining up free help when your own project gets off the ground. You will also gain experience of building work and find out before it's too late if you really want to self-build. Chat to neighbours who are planning house extensions, ask who they are using for the build. You may pick up names of good tradesmen, more importantly you can learn who are the bad ones. Land Without Planning Permission: is it Viable?